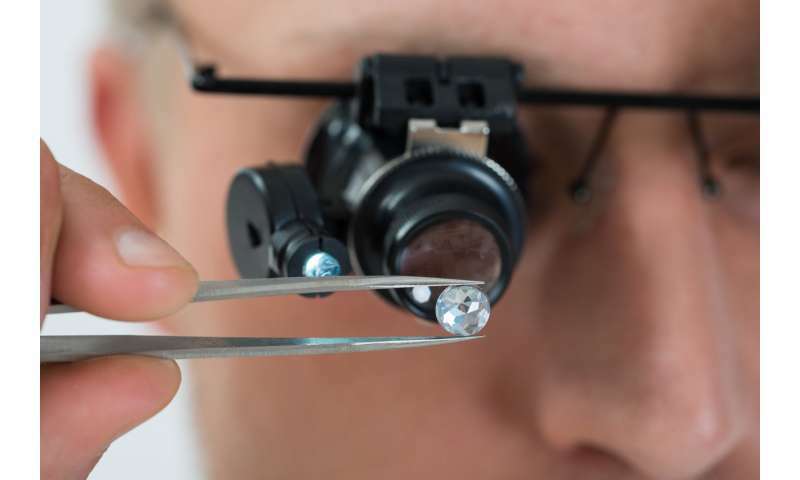 The world's biggest diamond company, De Beers, recently announced it would start selling synthetic diamond gemstones for the first time in its 130-year history. Artificial diamonds have been manufactured since the 1950s but De Beers has long resisted moving into the synthetic market. The company now believes that technology is efficient enough to produce large quantities of synthetic diamonds with the quality of the best gemstones. How exactly does this process work? Diamond is highly valued as a transparent gemstone that sparkles like no other. It is also one of the hardest of all materials and feels cold to the touch. All of these remarkable attributes depend on the perfectly regular arrangement of atoms inside the diamond crystal and all these atoms are exactly the same – they are carbon. Tiny imperfections in this arrangement, whether an atom that's in the wrong place, missing or of a different element, can lead to huge changes in the diamond's colour. For example, replacing one carbon atom in every 10,000 with a nitrogen atom would turn a transparent gemstone brown. Getting carbon atoms to arrange in this perfect crystal is not easy and it cannot happen naturally on the Earth's surface since carbon here prefers to form crystals of graphite, the soft black, material we use in pencil leads. In this environment, carbon atoms also tend to attach more easily to other atoms such as oxygen and hydrogen than to each other. This means that even making pure graphite crystals is difficult. Natural diamonds are made deep inside the Earth where, very rarely, the right ingredients at the right temperature and pressure are brought together and then transported to the surface over millions of years. The first artificial diamonds were made in the laboratory by replicating these conditions in huge machines, and this is still the way that small diamonds for industrial cutting tools are made today. It is also possible to make high-quality artificial diamond crystals by growing layers of carbon atoms one at a time using methane. This is done by stripping hydrogen away from methane molecules in super-clean vessels using hot plasmas. All the carbon is then forced to grow into diamond crystals, rather than into one of the many other types of carbon such as graphite, graphene or buckminster fullerene (unless of course you want to grow combinations of these very different materials). The challenge is to make this process, known as chemical vapour deposition (CVD) cost-effective. De Beers now believes it has reached this point and plans to extend production at its facility in Ascot in the UK and at a new diamond factory in the USA. Controlling the purity of these crystals also opens up new opportunities for using diamond. For example, it's possible to use each atomic impurity as a tiny torch that produces a single particle of light free from interference from its neighbouring atoms in the crystal. This can be used to store a single bit of information for a special "quantum" computer. Impurities of boron, as well as producing valued deep blue or black diamonds, are used to make diamonds that conduct electricity, providing an alternative material to silicon or metals in extreme conditions such as in space. Each natural diamond carries clues about its unique history and it is possible to reveal its origin by inspecting it with the latest instruments. Artificial diamonds also carry this information and differences in the way they glow in ultraviolet light are regularly used to distinguish natural from synthetic gemstones. So even if the diamond's perfection can't be questioned by the human eye, their tiny imperfections are always there to reveal their hidden histories and their individuality. I would wonder how they managed to make them with all that blood all over their hands? Well the great thing about the rising equality efforts of those that claim the female side of a partnership is retiring the need for the male side to in debt themselves in purchase pretty bobbles that are a manipulated marketed item of horrific historical precedence. So along with the equality standards that NEED to be engendered in our societies, like yesterday, or even the day before that, let us make sure we cast off the &^%($# marketing crap that continues to feed off our petty vanities. Here's looking ahead to the time when we have diamond computer screens and windshields. -can go uncut to the museum where they belong. Or to some lucky collector. Damnit and I had just finished my DIY maser to diamond kit to sell on the darknet. You mean to tell me I need to reformulate my plan to crash the price of diamonds to make nitrogen infused vacancy qubits? I don't have the resources to make nano diamond threads for memory yet!? Tell your woman, "no, we boycott this product" Dump her if she disagrees. Just as plasma processes are used to create artificial diamonds in the lab, so too are plasma processes responsible for creating diamonds in nature. Oh good grief cantthink85, chemical vapour deposition is about as far as you can get from how diamonds form naturally.